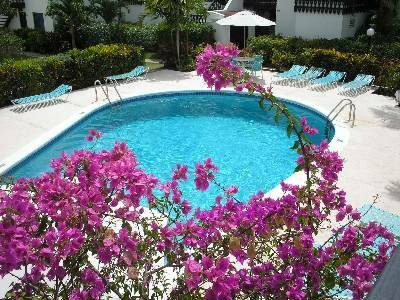 A lovely apartment ideally located on the south coast of Barbados, walking distance to beaches, entertainment, shopping and other amenities. Swimming pool, golf and tennis. This very nice apartment is in a quiet, peaceful setting, suiting 1 or 2 people, looking onto the 7th green and 8th fairway of Rockley golf course. It has a private patio with chairs & table and a good, gas-fired barbeque. It is equipped with a/c, t.v. (cable), wifi internet, microwave, fridge, stove etc. in a small kitchen. New Queen-size bed. It has a bathroom with bathtub, shower, toilet and sink. The swimming pool and laundry are close by. Golf & Tennis courts are on the premises. The resort is close to the Garrison Savannah and the UNESCO World heritage area. Rockley, on the south coast of Barbados. The apartment is within short walking distance of excellent beaches, including Accra and Worthing beach, shops-including duty-free, post office, banks and some great bars & a variety of restaurants, from fast food to top class French cuisine. short 10 min. walk away. If you don't want to rent a vehicle, public & private buses pass regularly (US75 cents per ride) and it's easy to get to the capital, Bridgetown. Plenty to do in Barbados. Swimming, Golf courses, Tennis courts, great beaches, surfing, wind and kite-surfing, diving and snorkeling, sailing, water-skiing. Go on a catamaran cruise or deep-sea fishing expedition. Horse racing & Barbados museum at the historic Garrison, art galleries, Ocean Park Aquarium, Graeme Hall Nature Sanctuary, music and cultural shows such-as the 'Tropical Spectacular' . The annual 'Crop-Over' festival in summer should not be missed! Harrison's Cave -a beautiful limestone cavern. Visit the tranquil west/Caribbean coast with calm sea. The Atlantic coast includes Bathsheba ( with the famous Soup Bowl surfing break-Kelly Slater's favourite), the Scotland district and Barclay's Park. Farley Hill National Park and the oldest working windmill in the Americas- Morgan Lewis Sugar Mill. The laundry facility with washers and dryers is separate from the apartment. The views from the patio are of the gardens and Rockley golf course.